The 2013 Bennett C. Jones Award for Outstanding Median Hybridizing went to Ken Fisher of Bella Vista Arkansas, in recognition of his many contributions to median iris hybridizing. 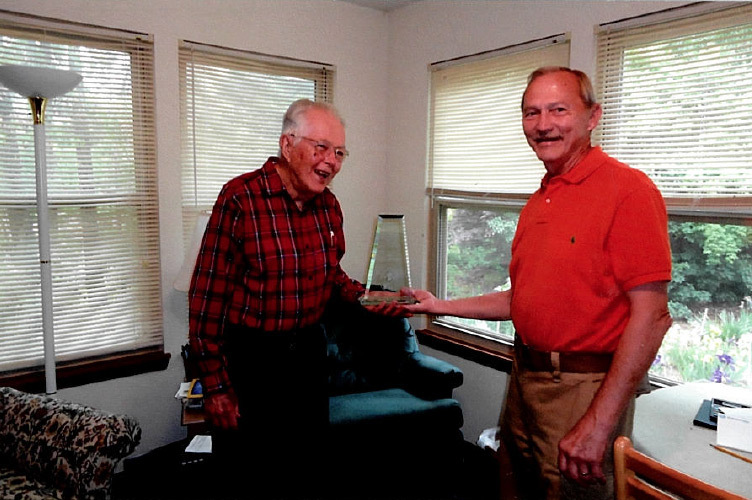 James Bledsoe, Region 22 RVP, presented the award to Ken in his home in Bella Vista, Arkansas. Ken Fisher has been hybridizing Miniature Tall Beardeds (MTBs) since the late 70s, breaking ground with his MTB introductions since the early 80s, working with both diploids and tetraploids, as well as working diligently on hybridizing diploids and tetraploids together, achieving a reasonable degree of fertility in these complex lines. Through 2012, Ken has registered 53 MTBs, introducing 51 of them to commerce. He has brought a great many excellent, high-quality, vigorous, floriferous MTBs into our gardens, many of which today's MTB breeders are taking advantage of in their own breeding programs. Ken’s greatest success has come from hybridizing diploid MTBs, but he has also been able to accomplish diploid/tetraploid crosses with some fertility, such as ‘Sailor’s Dream’ (2004), a rare pure medium blue, which won the Franklin Cook Cup as the best out-of-region iris at the 2006 AIS National Convention in Portland, OR, beating out all classifications — including TBs! — and then went on to give him his latest Williamson-White medal in 2010. Ken has won 6 Williamson-White medals (2010 'Sailor’s Dream', 2004 ‘Merit', 2000 'Pardner', 1998 'Striped Pants', 1997 'Zula' and 1995 'Frosted Velvet'), the most of any hybridizer in median history, and one Williamson-White award (AM equivalent before 1993, when it obtained medal status) in 1989 for 'Zula', as well as 10 AMs. He also won the Walther Cup (an award for the most HM votes in that year in any iris class) in 1991 with his MTB ‘Frosted Velvet’. Ken has also been active in MIS; he was instrumental in the fundraising to publish The Medianite anniversary issue in 2007, with a "matching grant" donation challenge to the membership that kicked off a successful drive to fund the publication. Ken was awarded the AIS Hybridizer’s Medal in 2003. Thank you Ken, for the pioneering work you’ve done with MTBs, and all of your other contributions to the Median Iris Society and the greater iris world!